Get a Kitchen Air & Fire Control Assessment from Flue Steam | Flue Steam Inc.
Not sure if your kitchen air control and fire prevention equipment is up to code? Flue Steam can help. Numerous fire and safety code regulations govern commercial kitchens. Staying in compliance is very important, both from a legal standpoint and for the safety of your employees and customers. 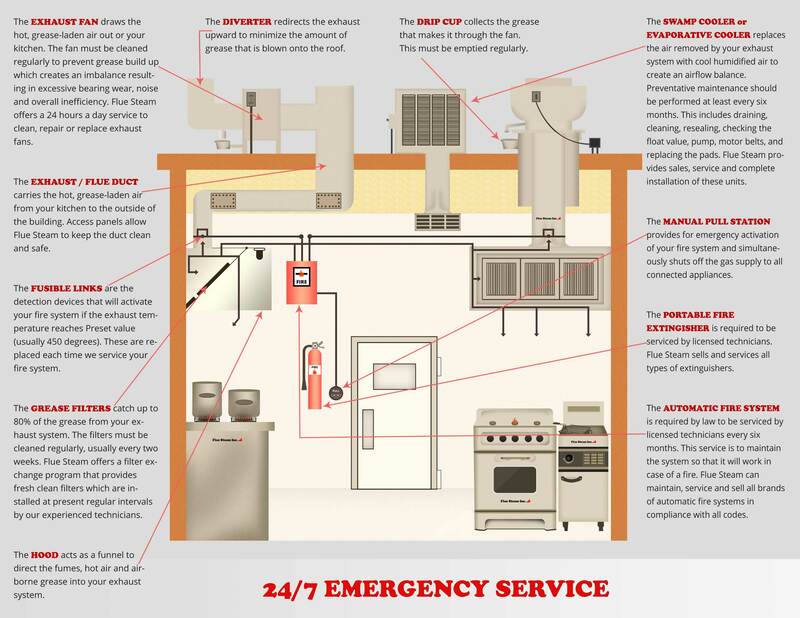 At Flue Steam, we are your LA area kitchen air control and fire prevention experts. We can come take a look at your kitchen and recommend any changes or services that may be necessary to remain in compliance with relevant air control and fire prevention safety codes. Here’s an overview of the services we can provide. Our service technicians are IKECA certified, which means they have completed training courses in the International Kitchen Exhaust Cleaning Association’s definitive standards for cleaning, inspecting and maintenance of commercial kitchen exhaust systems. This enables them to provide expert assessments of the current condition of your exhaust hoods and ducts and perform high-quality cleaning as needed. We offer two cleaning services, hand scraping and steam cleaning. Hand scraping is recommended for monthly or quarterly cleaning ofeasy-to-reach areas where grease tends to accumulate most rapidly, such as the exhaust hood. Steam cleaning is recommended for deep cleaning every nook and cranny of the entire exhaust duct system once or twice per year. We’ll help you determine the cleaning frequency that is needed to keep your grease deposits from growing into the danger zone. We also offer expert service for swamp coolers, including annual inspections, cleanings, and tune ups. Our technicians understand the vital role the swamp cooler plays in providing clean, fresh air to your kitchen, and we can help ensure it is always ready to do its job. We can even check that your swamp cooler is correctly sized for your kitchen to ensure no safety hazards are being created by inadequate airflow. 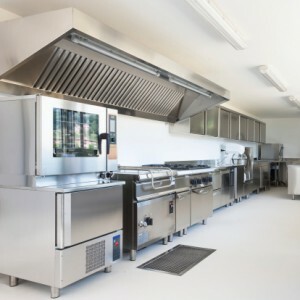 The automatic fire suppression system is a very important failsafe for any commercial kitchen. Our technicians can provide all the services required to keep your system code compliant, such as refilling and resetting the system after a discharge. Having functional portable fire extinguishers at strategic locations around the kitchen is not only required by law, but also necessary for nipping small fires in the bud and protecting your property and your employees from grease fires in the kitchen. At Flue Steam, we carry a variety of portable fire extinguishers to help you meet your code obligations. We can also service and refill these extinguishers as needed.